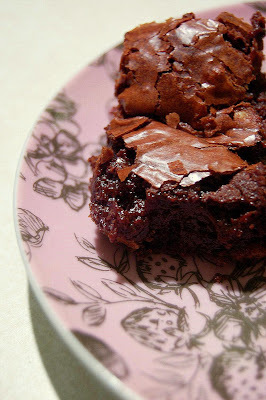 yummyyyyy.. i loovveee brownieesss.... interesting blog with amazing recipes.. keep it up!! I have heard this recipe is delicious from multiple people. It sounds like I am ging to have to try it. Yours look great! Thanks for the tips on halving the recipe. Love your serving plate! I can't wait to try these! I love everything of Ina's I've made! Oh, Yum! I've made these before and they are quite a treat. I tossed Oreos in there once and WOW!! They look amazing, Anne. oh my brownies twice in one week! they do look yummy! Wow, you've had a brownie-filled week! I halved the recipe too. I totally forgot the flour though. I made the full batch as I was going to a family gathering. Ina's brownies are incredible. I recently made a half batch of her outrageous oreo crunch brownies variation and they were terrific too. New to your blog and love it! The brownies look amazingly moist!! :) Gotta love Ina! Seeing how delicious yours look, and reading that you were careful not to overbake, made me realize I left these in too long. As much as it pains me to kill another pound of chocolate, I think I'm going to have to make them again. They were pretty outrageous! I halved them too--because of the butter (1/2 pound felt much better!) The don't over-bake warning made me paranoid too! Could not agree with you more about the understatement! These were fabulous! They look really good. I LOVE your serving plate too! Lovely brownies...my first time on your site...great pics! i thought the pound of butter sounded excessive so i halved the recipe too and made two 8x8 pans! brownies for everyone! I'll have to try this one - I am always on the lookout for a good, gooey, fudgy brownie, and it looks like you liked this one a whole heck of a lot better than the chipster brownies from TWD. You are so right. Our Ina is not going to throw around the word "outrageous" lightly. And these did deliver. I was kicking myself because I used espresso powder, which gave mine kind of a "mocha" taste. I'll use coffee powder next time like the recipe calls for, or just follow your lead and leave it out all together. I think the pound of butter and two pounds of chocolate can carry the load, don't you? Oh, I used slacker large eggs too. Rebels, we are! Your brownies look . . . outrageous! I wish I thought to halve the recipe, although maybe that would mean that I wouldn't still have two boxes of brownie in my freezer. I will definitely make these again. My kitchen aid is my best friend, yet I treat that thing so hard. The brownies were awesome, I halved the recipe too. You're right: there's no words for how good these brownies look. Words like outrageous and delicious and stellar are total understatements, but let me try to put it into words nonetheless: OH MY GAH. I cannot wait to try out Ina's recipe. So glad to hear Ina's brownies are as outrageous as she says they are. I will try them now instead of my own recipe- but I do love coffee so will use it. The brownies were excellent. I'm still trying to decide on the best size pan to use when halving the recipe. I did mine in a 6 x 9. They were thicker than Ina's. Yours look a lot like mine. I've made these before and you're right ~ they are outrageous! Love it. I think I'll half the recipe too. Can't wait to try it! Lots of brownies this week. I need/want to try Ina's Outrageous recipe sometime, soon! They look great! The brownies are amazing, aren't they? Ina always delivers! Yours look great! Glad you liked them. My KitchenAid also revolutionized my kitchen. I went for way too long without it. Every make angel food cake with a whisk or a yeast dough by kneading by hand? My shoulders were actually sore after the first time I did that. I can't imagine going back now.